U.S. markets sold off hard Tuesday, the S&P 500 plunged more than 3.2% between the session’s open and close. The message from Mr. Market is pretty clear here: The volatility that rocked investors in October isn’t over, at least not yet. From a sector standpoint, there’s one very clear answer: Utilities. In fact, on an intermediate term, utilities are the only sector that’s actually still in an uptrend right now. As a hedge against more market jitteriness, that makes utilities a solid place to be. 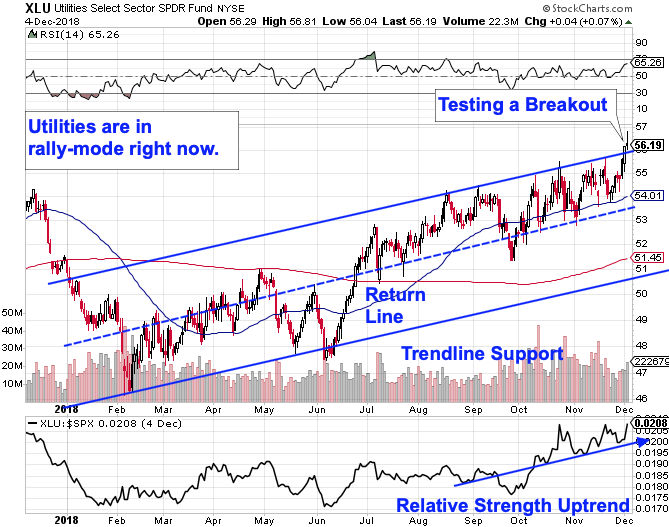 It doesn’t take an expert trader to figure out what’s been happening in the Utilities Select Sector SPDR ETF (XLU) , a popular exchange-traded fund that offers one-trade exposure to the entire sector. Simply put, XLU has been bouncing its way up and to the right all year long. That persistent utility performance in 2018 says something about how this year has looked from an overall risk standpoint; utility stocks have been a flight-to-quality play all year long, and their uptrend signals just how anxious investors have been all year long. Fed Chairman Jay Powell’s recent turn to a dovish stance on rates adds fuel to the uptrend in rate-sensitive stocks like utilities. If markets continue to be under pressure, utilities look attractive from a defensive standpoint. On the other hand, if markets get back to rallying, utilities look attractive because rates aren’t likely to get hiked as quickly as income investors had feared. That’s a “heads I win; tails I don’t lose” scenario for utility investors. Right now, XLU is testing breakout territory at the top of its uptrend after holding in the upper-half of the trend channel since the final stretch of June. A breakout here could signal an acceleration of the trend in XLU. On the other hand, if volatility gets tamped down a bit, investors should expect a correction to the return line on the chart above as a buying opportunity. Relative strength continues to be the most important side-indicator you can put to work in this challenging market environment: As long as XLU’s relative strength line is pointing up and to the right, utility exposure continues to make a lot of sense in this market.